Leaded have historically been utilised in all forms of Motorsport. Leaded Fuels now can only be used in certain classes of racing. Proof of ID is required along with proof of being a member of a licensed racing club that is allowed to use Leaded Racing Fuels examples being Cams or Andra. The Australian Government has stated that as of the 30th June 2019 Leaded fuels will no longer be allowed to be sold within Australia and many racing associations have banned the use of Leaded fuels for the 2019 Financial Year. Before purchasing for the remainder of this financial year (2019) we recomend you first check as to whether your class of racing will still allow leaded fuels to be used. We recomend to all customers they check out the new and growing range of unleaded fuels which are replacing traditional leaded fuels. After 44 years of custom blending fuels, ERC has been produced custom blends meeting some very unique application specific requirements. We started out doing blends of this type, and over done specific custom fuels for everything from model airplanes, classic vintage sport cars, super-bikes, Reno air racers to NHRA pro-stock cars. USA Quality, imported into Australia with a wide range of applications. Limited to Leaded and Unleaded fuels at this time, there range is growing tremendously for the 2018 / 2019 racing series with a whole range of new unleaded fuels to become available. ERC 110K is an extremely cost-effective, bulk-blended product constructed primarily with alkylated isoparaffinic and aromatic blending stocks. It contains the absolute minimum quantity of combustion reactive, gum forming olefinic materials. High ASTM Octane numbers are obtained from the use of high grade branched chain alkanes possessing superior tetra ethyl lead (TEL) sensitivity and high resistance to heat and pressure. TEL levels are moderate, and appropriate quantities of effective lead scavengers and combustion chamber deposit cleansers have been incorporated into this fuel. Oxygenated octane improver’s are utilised; and a proven antioxidant is used to maximise storage life. Additionally, an extremely effective fuel system with cleanliness additives used. High heat values per unit volume and the capability of running leaner A/F ratios produce excellent mileage figures in real world race conditions. ERC 110K has demonstrated a superior convective cooling coefficient related to extracting heat from the combustion chamber during periods of overlap flow. This characteristic gives it the capability of reducing cooling system heat exchange loads, thereby allowing engine operation with lean mixture/best power tuning adjustments for extended periods. Recommended for high RPM engines with high CRs over 14:1 when additional octane is required for better detonation protection. This fuel is specifically designed for large capacity engines with rpm ranges in excess of 7000 rpm. Especially suitable for circle track racing with rapid throttle changes like Australian Speedway. VP 110, C12 & C14+ – Minor re-tuning required (Depending upon compression ratio). Sunoco Standard & Supreme – Minor re-tuning required (depending upon compression ratio). BP / Shell Avgas – No re-tuning required (When Upgrading to ERC 110K). Used in turbocharged engines, blown engines and nitrous applications with CRs up to 17:1. Suitable for older engines with low rpm ranges. Suitable for turbocharged and supercharged engines, especially those non inter-cooled. More modern day turbocharged engines would be better to use the Max ULB or Sportsman DX. This specific fuel allows more ignition timing compared to other brand fuels for the same application, allowing greater power to be made. VP C16 – No re-tuning required. VP Import – Minor re-tuning required. Sunoco Maxnos – Minor re-tuning required. ERC A-19A Racing Gasoline’s are predominantly paraffinic in character, containing a small highly concentrated high quality aromatic fraction. They are custom blended in smaller quantities and are intended for normally aspirated engines. These blends produce higher bomb calorimeter readings commensurate with higher heat values per unit weight. Blending stocks were chosen with high hydrogen/carbon ratios and elevated resistance to heat and pressure as the main criteria. Fuel mileage with these blends is poorer than with higher density fuels; and in order to achieve proper air fuel ratios, additional fuel flow is required. Power increases on the order of 1.0-2.0% o/c are typically reported with these blends over more standard leaded type fuels. ERC A-19A is recommended for normally aspirated engines used in drag racing, circle track racing and other short duration events in which RPMs are usually elevated and cooling system capability is more than adequate. VP C14+ & C25 – Minor re-tuning required. Sunoco HCR+ & Maximal – Minor re-tuning required. This will work well in any drag racing or circle track application — naturally aspirated, nitrous or blowers. The high oxygenation will significantly expand the range of air/fuel ratio acceptability, so performance will be more consistent and won’t vary as dramatically with altitude or density changes. 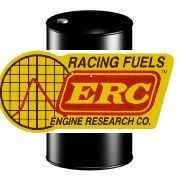 ERC Sportsman DX will work well in any drag racing or circle track application — naturally aspirated, nitrous or blowers. Being highly oxygenated, requiring a 4-6% increase in fuel flow, which will make 3-5% more power than competitive 116 octane fuels. High Levels of oxygenation will significantly expand the range of air/fuel ratio acceptability, so performance will be more consistent and won’t vary as dramatically with altitude or density changes. For bracket racers, variations in ET from run to run will be substantially reduced. VP ROO16 & Q16 – No re-tuning required. Sunoco EX02 – No re-tuning required. ERC Auspro DX3M is a highly oxygenated leaded race fuel that has been proven to out perform the VP Roo25+, Dingo and equivalent fuels. Approved by ANDRA for use at sanctioned events ERC Auspro DX3M is ideal for use in Australian Pro/Super Stock and comp eliminator applications. The oxygenation will significantly expand the range of air/fuel ratio acceptability, so performance will be more consistent and won’t vary as dramatically with altitude or density changes. This fuel has proven to be more stable and consistent for ET’s during higher track day temperatures in comparison to the VP Roo25+ and PSX-AU Fuel. This does not require special carburetors, although attention will be required on the needle and seat materials. VP Roo25 / Dingo – Minor re-tuning required. VP PSX-AU – Re-tuning and carburation changes required. Winning on today’s racing tracks requires more than an exceptional driver and a well-built car. It takes high-performance racing fuels that are willing to go the distance. As the largest manufacturer and refiner of racing fuels in the world, Sunoco has nearly five decades of winning performances, with a long history with Nascar and recently, the spec fuel supplier for USA Drag Racing. Sunoco is also the named fuel sponsor for Australian Andra and IHRA Drag Racing. Supplying Petrol, Ethanol and Methanol fuels, they can be found in every form of motorsport within Australia. With an growing range of fuels, these fuels will exceed your expectations. Join the winners circle and find out about what this fuel can do for you. Sunoco® Standard™ is a 110 octane leaded race fuel that is commonly used in all forms of motor sports and features a comprehensive additive package to enhance shelf life by improving stability and minimising oxidation. Sunoco’s all-purpose leaded racing fuel with a winning heritage, Sunoco Standard ™ provides quality, performance, and consistency for ease of tuning. It is ideal for virtually all forms of motorsports, including circle track, drag, motorcycle, road racing, off-shore powerboat and off-road. It also features a broad range additive package for protection from oxidation, corrosion and deposit formation. Sunoco Standard is designed for competition engines with compression ratios up to 13:1. This fuel is the perfect replacement for Aviation Fuel which is inherently inconsistent. No retuning required and immediate improvements in performance and reliability. VP 110 – No re-tuning required. Sunoco® Supreme™ is a 112 octane leaded race fuel designed for competition engines routinely operating over 7000 rpm. Supreme is blended to achieve a high motor octane number and fast burn speed to ensure engine protection lap after lap and pass after pass. Sunoco Supreme is designed for compression ratios up to about 15:1 in small block V8s, and can tolerate higher compression ratios in smaller or more efficient combustion chambers. Supreme’s fast burn speed also makes it a popular choice for 2-stroke applications and is particularly useful for speedway and circuit racing vehicles. Sunoco MO2X leaded is racing fuel designed for excellent throttle response in high compression, high rpm 2- and 4-stroke applications such as motorcycles, all-terrain vehicles, snowmobiles, and karts. Significant improvements in throttle response and acceleration compared to normal 98 RON fuel and other octane limited fuels. MO2X offers better protection against detonation in harsh racing conditions, makes more Horsepower and Torque than premium pump fuel and gives you exact consistency so you don’t have to alter you tune up from drum to drum. This fuel is heavily used in Australian road racing Motorcycling achieving great results and is fast becoming the fuel of choice for many owners, especially where using USA Sourced engines requiring the higher octane fuel. This is particularly good with 2 Stroke Engines showing significant gains in power and torque with improved consistency and outperforms all other current motorcycle specific fuels. This fuel is a hybrid leaded / oxygenated unleaded fuel (Based off the Sunoco MO2X Unleaded fuel) and has no direct competition with any other fuel supplier in Australia at this time. VP MR12 – Re-tuning required. VP MRX02 – Re-tuning required. Sunoco Maximal is a 116 octane, extreme performance leaded racing fuel designed for high revving racing engines with high compression ratios. Maximal’s fast burn rate makes it particularly beneficial in large-bore, large-displacement naturally-aspirated drag racing applications. A leaded racing fuel for exceptionally high performance two- and four-stroke applications generating high cylinder pressures, Sunoco Maximal™ will help protect engines with static compression rations up to 17:1. It has a very narrow distillation curve and a low final boiling point to help improve thermal combustion efficiency at high engine speeds. Sunoco Maximal’s distinctive fast burn characteristics provide more complete combustion than slower burning fuels in applications which operate in excess of 10,000 rpm. It has also proven to be very popular in the highly-stressed naturally-aspirated big blocks used in truck pulling. Sunoco Maximal is very resistant to vapour lock, ensuring consistent fuel metering between passes. This is particularly effective in motorcycle engines with there high revving nature in drag racing applications. VP SV05 – Re-tuning required. ERC A19A – Minor re-tuning required. Due to its high oxygen content, Sunoco EXO2 requires a richer air/fuel mixture. Using EXO2 without proper air/fuel mixture changes can lean out your engine. Since non-oxygenated race fuels typically have a stoichiometric air/fuel ratio of 14.6:1 to 15.0:1, you may need to rich-en your fuel mixture by 10 to 15 percent when using EXO2. This fuel is a hybrid Leaded / Unleaded fuel which has the advantages of both types of technology. As with any gasoline, EXO2 should be stored in opaque, tightly sealed containers where temperatures are stable. VP ROO16 & Q16- Minor re-tuning required. ERC Sportsman DX – Minor re-tuning required. Sunoco MaxNOS is the fuel of choice for extreme performance applications where “power adders” such as nitrous, superchargers, and turbochargers are utilised. Sunoco Race Fuels engineers added components to this fuel to be able to withstand ultra high pressure / high temperature combustion chamber conditions. MaxNOS was tested in a variety of drag racing applications ranging from mega-boost turbocharged small engines to multi-stage nitrous systems on mountain motors and all forms of supercharged engines especially non intercooled systems. This fuel has been modernised so that it is suitable for older model V8 Supercharged engines to more modern day multi valve inter cooled turbocharged vehicles. Sunoco MaxNOS is for off-road and racing use only. It contains additives to enhance stability and minimize oxidative effects. As with any gasoline, MaxNOS should be stored in opaque, tightly sealed containers where temperatures are stable. Handled under such conditions, the shelf life of Sunoco MaxNOS is 3 years or more. VP C16 – Minor re-tuning required. ERC A8D – Minor re-tuning required. Sunoco® HCR™ Plus is a high performance leaded racing fuel designed for racing engines with very high compression ratios. It is particularly beneficial in sustained high speed / high load applications such as asphalt and dirt oval racing. HCR Plus is very resistant to vapor lock, ensuring consistent fuel metering from the green flag to the chequered flag. Sunoco HCR Plus is recommended for engines with compression ratios exceeding 14:1. Sunoco HCR Plus is not a street legal fuel and is for off-road and racing use only. It contains additives to enhance stability and minimize oxidative effects. As with any gasoline, HCR Plus should be stored in dark, tightly sealed containers where the temperature is stable. Handled under such conditions, the shelf life of Sunoco HCR Plus is 3 years or more. This fuel has been imported into Australia to meet the popular importation of late model V8 vehicles moving away from Methanol and back to Petrol based fuels for the Speedway competition. The result have been exceptional, especially compared to the use of Aviation fuel and other lesser leaded fuels. Sunoco SR18 is our ultimate high octane, fast burning racing fuel. If you have a high compression, high RPM race engine, 118 octane Sunoco SR18 is your fuel of choice. SR18 is an excellent choice for drag racing and truck pulling, especially large displacement applications. It’s also a good choice for 2-stroke racing snowmobiles because the fast-burning SR18 offsets the slower-burning oil present in 2-stroke engines. For oval course and road racing applications, SR18 will tolerate the high cylinder pressures in racing classes where there are no compression ratio limitations. Sunoco SR18 is for off-road and racing use only. It contains additives to enhance stability and increase storage life. As with any gasoline, SR18 should be stored in opaque, tightly sealed containers where temperatures are stable. Handled under such conditions, the shelf life of Sunoco SR18 is 3 years or more. This is the new spec fuel for USA Drag Racing and is available for Australian Top Level Drag racing. VP C25 – Re-tuning required (Depending upon compression ratio). VP Late Model Plus – Re-tuning required. ERC A19A – Re-tuning required. Offering you the world’s best performing race fuel blends, customised for motorsports. Each of VP’s fuels is designed for optimum performance in a specific application – including yours. VP Racing Fuels has the full range of Leaded, Unleaded, Ethanol and Methanol fuels available to meet every racers expectation. VP’s best fuel yet for 4-stroke applications that can tolerate lower octane values, makes more power for powersport applications than any fuel on the market. Dyno tests proved up to 5% more power than VP’s MR9 and up to 6% more power than VP’s MRX01! Although currently not legal in AMA Pro Racing, MR12 passes fuel rules for AMA Pro/Am, CCS, WERA, AFM, NMA, WORCS, SCORE and Best in the Desert as well as club level racing and more. Sunoco MO2X Leaded – Re-tuning required. Arguably, the best performing two stroke motocross fuel for stock and modified engines, period! Surpassing MRX01, MRX02 is effective in delivering up to 7% more power than pump gas and any basic non-oxygenated race fuel. This high end fuel blend passes rules for AMA Pro/Am. It will also help to keep your fuel container wrapped in a RACEPRO “Cool Fuel” Ice Jacket prior to dispensing in your fuel tank. One of the best all around racing fuels ever made. Recommended for CRs below 15:1, satisfying the needs of 75% of today’s race engines. One of the highest winning fuels in racing history, including Modified Tour, GNN, D.I.R.T., Indy Lights, NHRA, AMA as well as other local and national championships across the U.S. and around the world. VP C12 is imported specifically for older vehicles, currently utilising Avgas and requiring a high octane leaded fuel without requiring massive retuning, and being suitable for a wide range of applications. This is particularly effective for historic road racing vehicles and was the prime reason for its importation into Australia. VP C12 is also particularly suitable for speedway vehicles, and its the leaded fuel that all others compare themselves to. Sunoco Standard – Minor re-tuning required (depending upon compression ratio). Sunoco Supreme – Minor re-tuning required (depending upon compression ratio). ERC 110K – Minor re-tuning required (depending upon compression ratio). Recommended for high RPM engines with ultra high CRs over 14:1 when additional octane is required for better detonation protection. A long time favorite of Australia, this fuel is specifically designed for large capacity engines with rpm ranges in excess of 7000 rpm. Especially suitable for circle track racing with rapid throttle changes like Australian Speedway. Its a classic that is just as suitable today as it was the day it was first designed all those years ago. Well suited to drag racing motorcycles and other forms of motorsport including speedway , circuit racing and drag racing. This is a major improvement over traditioanlly available Avgas but will require re-tuning. Sunoco HCR+ – Minor re-tuning required. Sunoco Maximal – Minor re-tuning required. Recommended for use on 3/8 mile or greater dirt and asphalt circle tracks in engines bigger than 400 CI with CRs up to 15:1. Burns cooler, making as much power on the 100th lap as on the first. Late Model Plus has fueled the World of Outlaws Late Model Series champion for three consecutive years through 2008. Numerous winners of the World 100, Eldora Dream, Dirt Track World Championship, Show Me 100 and Colossal 100, as well as many other crown jewel events and series championships. Very popular in Australia with the influx of American Sourced vehicles utilising specially built USA Engines designed to use this fuel. Used in turbocharged engines, blown engines and nitrous applications with CRs up to 17:1. Recommended by the top nitrous oxide companies. Spec Fuel for NHRA Comp Eliminator and used by Sport Compact champions. Suitable for older engines with low rpm ranges. For those utilising higher rpm ranges in excess of 7000 RPM using the VP Import may be a better choice. Especially suitable for turbocharged and supercharged engines, especially those non intercoolered. This is an old favorite for many racers over the last 20 years and is still immensely popular, although there are now many more modern fuels available which are more suitable for late model multi valve engines. Recommended for ultimate performance in nitrous oxide applications with CRs up to 18:1. Used in ADRL, Sport Compact, and large 800 CI IHRA-style drag race engines. Now Available for use in all ANDRA sanctioned events.. Maximum power and torque in small displacement, high RPM, all motor, turbocharged or nitrous sport compact applications. Makes 5% more power than C16 and similar non oxygenated fuels. Works well under high temperatures due to mechanical heat. This fuel works well with Speedway engines particularly requiring high octane than C14+ where high compression ratios are being used. Not well known in Australia, as its more suitable for later model engine designs, especially multi valve engines. Sunoco MaxNos – Minor retuning required. Sunoco SR18 – Minor retuning required. ERC A8D – Minor retuning required. VP Roo16 will work well in any drag racing or circle track application — naturally aspirated, nitrous or blowers. Roo16 is highly oxygenated, requiring a 4-6% increase in fuel flow, which will make 3-5% more power than competitive 116 octane fuels. Roo16’s oxygenation will significantly expand the range of air/fuel ratio acceptability, so performance will be more consistent and won’t vary as dramatically with altitude or density changes. For bracket racers, variations in ET from run to run will be substantially reduced. This added fuel flow also effectively increases its octane by 6-8 numbers above its standard ASTM octane rating. VP Roo16 and Q16 are identical fuels, the only variation being that VP Roo16 has a different colour to the VP Q16 fuel for homoligation Purposes in Australia Andra. Sunoco EXO2 – Minor re-tuning required.